Is life getting in the way of your business idea? Perhaps you’re not ready to leave the day job, or are stuck with the next part of your business journey? We’re here to help. The 5-9 Club is a 8 week after hours course (held on Wednesdays), designed to help you through the early stages of enterprise, allowing you to get all the business support you need to get your idea moving. You may have already started your business and need a little support, or you may just be at the idea stage – it doesn’t matter. 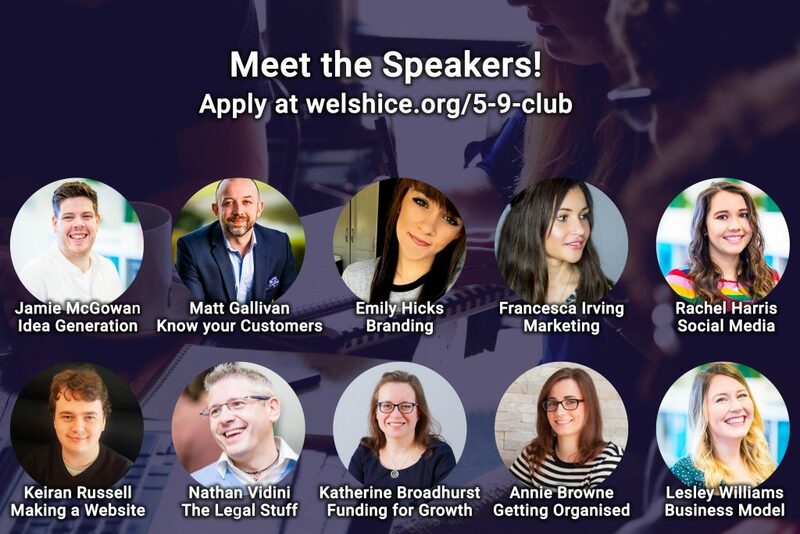 The 5-9 Club gathers experts from the Welsh ICE community to give advice on topics such as social media, sales, legal and more, and best of all you’ll be surrounded by like-minded people to help fuel your creativity. Sounds good, right? We’ve already run 8 successful 5 – 9 Club’s at Welsh ICE, and now we’re taking it on tour to a town near you! There’s a small commitment fee of £20 but food will be provided alongside the training each week. We are now taking applications of interest for all future cohorts of 5-9 Club, so if you’d like to join us next time or just learn a bit more, please fill in the simple form below, and we’ll get in touch! "After thinking that I would never have the confidence to ‘pitch’ my business idea, I have now done it so many times during the 12 weeks of 9-5 that I have delivered it to council officials and landlords without giving it a second thought. They all comment that my passion is clear – and that is all thanks to 5-9 for giving me the confidence to believe in my idea by their belief in me and their encouragement."